NASA created a map of the aerosols on on August 23, 2018 as on that day, huge plumes of smoke rose over North America and Africa, three separate tropical cyclones churned in the Pacific Ocean, and large clouds of dust blew over deserts in Africa and Asia. 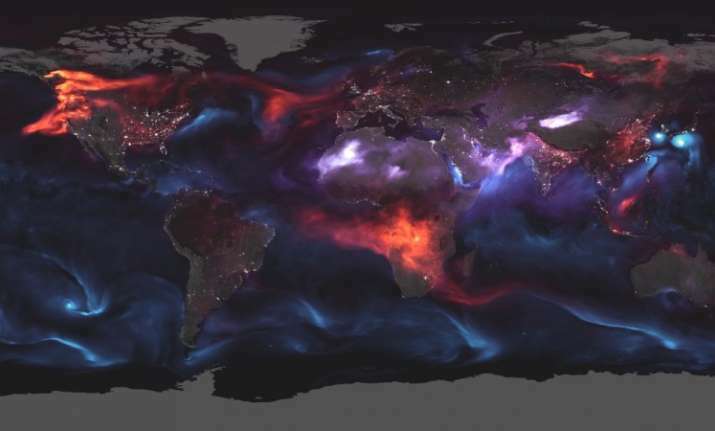 The US space agency NASA has created a map showing the global distribution of aerosols or small specks of solid particles or droplets suspended in the air. And it is stunning. Aerosols, the millions of solid particles and liquid droplets that exist within the air we breathe, are everywhere. They drift from the Earth's stratosphere down to the surface and they place a large role in Earth's climate and on human health—breathing in the wrong ones can be harmful. These particles or droplets emerge out of smoke billowing from a wildfire, ash hurtling out of volcano, or even dust blowing in the wind. This month has seen all three, with the first two happening within the United States. Black carbon particles from fires are represented by red, although they can also show car exhaust. The purple particles represent dust, and the blue particles represent sea salt aerosols. To capture their spread, NASA used their Earth-observing satellites Terra, Aqua, Aura and Suomi NPP. You need high-tech equipment to find such microscopic entities, like the Moderate Resolution Imaging Spectroradiometer (MODIS) on Terra. The MODIS has high radiometric sensitivity, meaning that it can visualize within 36 spectral bands in a wavelength of light. Measuring aerosols requires MODIS and Terra to observe how the particles change the way the atmosphere reflects and absorbs visible and infrared light. After viewing the raw data from these satellites, NASA then turned to its Goddard Earth Observing System Forward Processing model to process the data. Built to show analyses and forecasts based on data collected in real time, the GEOS FP releases data on a wide number of weather-related subjects.